This module explores ocean acoustics, focusing on the propagation and detection of sound in the marine environment. Sound propagation strongly depends on refraction caused by variations in sound speed, and reflection off the seafloor and sea surface. Detection of sound subsequently depends on its propagation path, background noise from human and natural sources, and the sensors used for detection. Is very importand, I hope the next be in spanish. Congratulations. Académicamente es necesario que la lectura e interpretación de mapas, tenga lección particular, y de ser posible recomendaría Foro interactivo, a manera de televideo conferencias. Fue un reto satisfactorio , agradezco la complejidad. Very difficult and my personal opinion all knowledge very interesting. complicado por que no se me facilita el ingles, pero buen tema. tuvo un grado de dificultad superior. This is an excellent course. It will definitely help me to better teach this subject to my students. I don't have a background in acoustics. For an introduction course, I found it to be very overwhelming. There are just SO many aspects to it. I think that refraction in comparison to sound velocity profiles and gradients needs to be explained more. 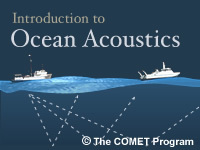 A Great "Introduction to Ocean Acoustics"
I took this quiz to compare it with the exam offered on Navy E-Learning's "Acoustics and Sound Ray Theory" course. I scored almost identical grades, and found the key elements to be very similar. Recommend this course if you cannot access the Navy E-Learning courses. The links to the sound clips for AN do not work/take you to the correct place. List of terms and definitions would be helpful. More examples and sample quiz questions during lesson phases would improve comprehension. Excelente curso de introdução sobre acústica submarina. Como submarinista, sempre recomendo aos meus alunos e aos engenheiros que trabalham com submarinos. Agradeço à University Corporation for Atmospheric Research's pela disponibilzação gratuita do curso. I like and learn from the class but it took me more than 2 hours. My background is geography not oceanography. I work as a cartographer in the maritime office.